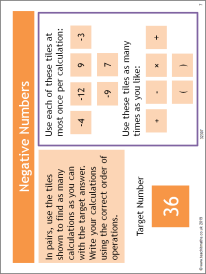 A game for revising calculations with negative numbers by creating calculations with a particular answer. Self differentiating and a great way to stimulate discussion. Suitable for KS3 and KS4. Some possible solutions are included in the slide notes.